Tags: Barack Obama, New Year, 2012, record unemployment, record poverty, downgraded U.S. credit, high misery index, government programs, William Warren, political cartoon To share or post to your site, click on "Post Link". Please mention / link to America's Best Choice. Thanks! Congress Where Is Our Return In Investment? By the Bankrupting America Team: Before we spend money on something, what’s the first thing we ask ourselves? What are we getting out of this? Whether it’s a mother buying groceries for her family or an investor buying stocks, it all comes down to return on investment. We should be asking the same thing when it comes to our tax dollars. We spend trillions of dollars funding the government every year, it’s only prudent to step back and consider what we’re getting for it. The following infographic takes a crack at this. But rather than breaking down the entire federal government, it allows you to examine if we’re getting our money’s worth from Congress. Did You Get Your Money’s Worth? accomplish in 2011? Did they get anything done? Did they cut spending? 2011 was a year marked by congressional battles over deficit reduction. In the end, we saw the downgrade of our nation’s credit rating1, and we saw the debt and deficit increase yet again during Fiscal Year 2011.
totals reached new records standing at nearly $15.129 trillion5. the calendar year, just over 70 bills were signed into law, a fraction of recent year totals. Furthermore, the number of bills passed by either chamber also failed to reach levels comparable to recent years. It should be clearly noted that it is impossible to measure the work of Congress based upon the number of measures passed. In some years, they pass lots of bills, buts lots of bills does not always equal sound economic policy. That being said, the number of measures passed by the House and Senate are one way to measure the productivity of Congress, but it doesn’t always tell the full story. 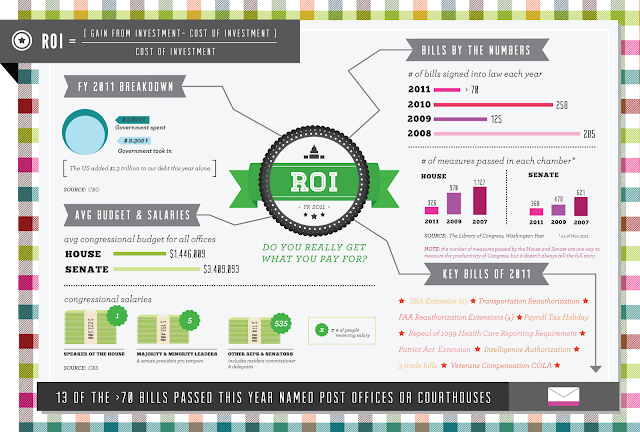 • 13 of the 70+ bills passed named post offices or courthouses. • The Budget Control Act raised the debt ceiling, led to the establishment of the super committee, and laid the groundwork for the upcoming sequester. So what do you think? Did you get your money’s worth? 1 Washington Post: S&P downgrades U.S. credit rating for first time. 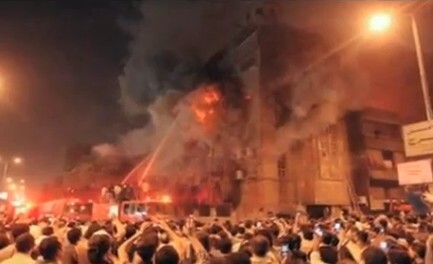 August 6, 2011. 2 CBO: Monthly Budget Review. FY2011. November 7, 2011. 4 Treasury Monthly Statement. November 2011. 5 Treasury: December 23, 2011. 6 Office of the Clerk: FAQ’s. #14. 7 Includes the Resident Commissioner and Delegates. 8 CRS: Congressional Salaries and Allowances. June 28, 2011. Pg. 3. 9 Congress passed a subsequent law that slightly reduced the Senate’s budget, but these numbers have not been updated by the Congressional Research Service. 10 All accomplishments as of December 19, 2011. 11 Government Printing Office. Public Laws; Library of Congress. Public Laws. a) As of December 27, 2011, the Library of Congress tally’s 73 bills for 2011; this is not the final tally, however. It will likely be slightly higher. b) For laws that were passed by Congress in one calendar year, (i.e., December 2010) but signed into law into the following year (i.e., January 2011), the law was counted when it passed Congress (i.e., 2010). 12 Washington Post: In 2011, fewer bills, fewer laws and plenty of blame. December 5, 2011. 13 Library of Congress: Public Laws. Tags: Congress, Congressional pay, Congressional salaries, effective governing, Government Spending, infographic, irresponsible governing, public pay, taxpayer funded, Bankrupting America To share or post to your site, click on "Post Link". Please mention / link to America's Best Choice. Thanks! Posted by Bill Smith : Post Link --> 11:03 AM 0 Comments - Share Yours! Below are two related articles about the White House disregarding our returning Veterans. Gary Bauer, Contributing Author: Here's another disturbing report from the Associated Press: "Americans probably won't be seeing a huge ticker-tape parade anytime soon for troops returning from Iraq." Two New York City councilmen -- not surprisingly both Republicans -- are calling for a ticker-tape parade similar to one held at the end of the first Gulf War, which was paid for with private donations. As one of the councilmen said, "The sports celebrations that we've had in New York for the Yankees and the Mets were amazing. But these are the real heroes." I agree. The Associated Press article notes, "In Washington, federal agencies take the lead on planning parades, and so far nothing is in the works." Why not? In the 60s and 70s, left-wing radicals infamously spit on our soldiers returning home from Vietnam. Barack Obama is smarter than that. Yet his administration is not taking the initiative to organize a national salute our heroes. Perhaps he's too afraid of offending the radical left-wing base of his party as we approach the 2012 elections. 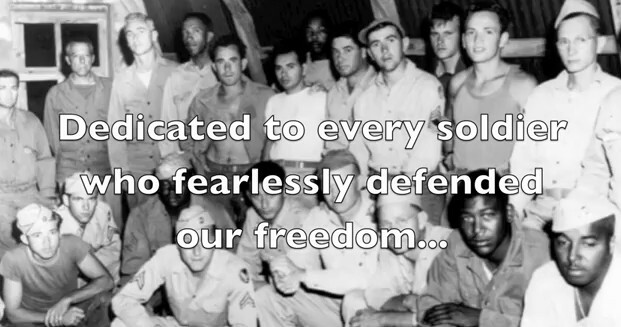 But as Calvin Coolidge once said, "The nation which forgets its defenders will be itself forgotten." 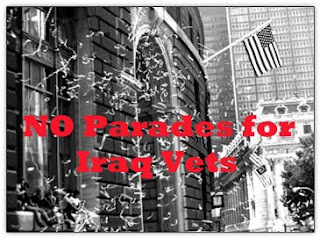 Stars and Stripes - Leo Shane III Reporting: WASHINGTON — No ticker-tape parades or flashy nationwide tributes for returning Iraq War veterans are planned right now, but not long ago government officials were preparing a posh celebration of the returning heroes and their overseas victory. In 2006 and 2007, Congress set aside $20 million in its annual defense budget bills for a party in the nation’s capital to honor the achievements of U.S. troops at the conclusion of Operation Iraqi Freedom and Operation Enduring Freedom in Afghanistan. . . . The White House still holds that authority, but funding for the celebration was shifted elsewhere by lawmakers in early 2007, as Congress fought over whether to support President George W. Bush’s proposed “surge” of troops into Iraq. Tags: Gary Bauer, Campaign for Working Families,Returning military, troops, President Obama, disrespecting troops, Stars and Stripes, no parade, no ticker-tape parade To share or post to your site, click on "Post Link". Please mention / link to America's Best Choice. Thanks! Posted by Bill Smith : Post Link --> 11:55 AM 0 Comments - Share Yours! Tags: A.F. 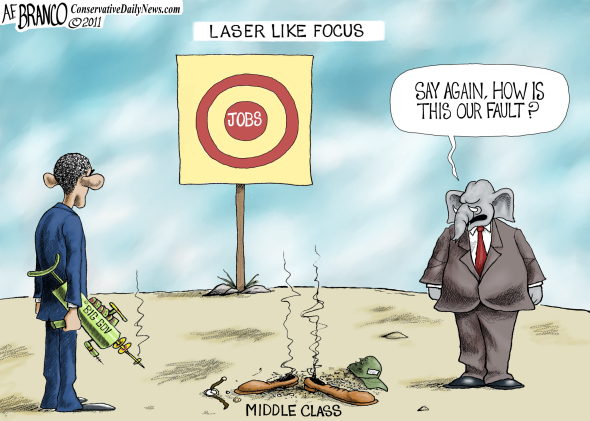 Branco, political cartoon, Obama, jobs, lazer focus, Michael Rameriz, Barack Obama, Media, Culture, Economy, Budget, Tax Policy, Government, Politics To share or post to your site, click on "Post Link". Please mention / link to America's Best Choice. Thanks! Posted by Bill Smith : Post Link --> 9:51 PM 0 Comments - Share Yours! 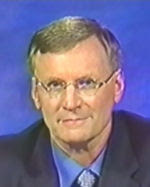 Dr. Bill Smith, Ozark Guru: I was humbled and blessed to receive a note from Laurie Sterling. It read, "Thank you from the bottom of my heart for serving in the USAF to defend my freedom! We need you, brother, we need you, now more than ever!" She included her video tiled the American Dream. I hope readers will also enjoy and share this video with others. It is a patriotic anthem for all Americans who love the U.S.A. and was dedicated to all who have worn the uniform to defend our freedoms and first responders. It even meant more because Laurie also wrote the song did the video layout. Patrick Bolen sings the song on the video and the music production was by Mark Keefner. Tags: American Dream, video, song, American, dream, United States, freedom, liberty, USA, patriotic, George Washington, Jesus, Savior, Pride, America patriot, tea party, founding fathers, U.S. Constitution, Declaration of Independence, Patriotism, military, Bible, guns, freedom, Laurie Sterling, Patrick Bolen, veteran, Bill Smith To share or post to your site, click on "Post Link". Please mention / link to America's Best Choice. Thanks! Posted by Bill Smith : Post Link --> 3:42 PM 0 Comments - Share Yours! 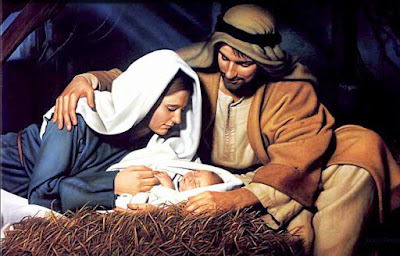 Tags: Christmas, 2011, Merry Christmas, Christ's Birth To share or post to your site, click on "Post Link". Please mention / link to America's Best Choice. Thanks! Adams was exactly right: America's birth is directly linked to the birth of our Savior. In fact, the United States of America is the only nation established by Christian people, founded upon Biblical principles, and dedicated to the purpose of religious liberty. This truth is easily observed within America's earliest history. "In the name of God, Amen. ... Having undertaken, for the Glory of God, and Advancement of the Christian Faith, and Honor of our King and Country, a voyage to plant the first colony in the northern parts of Virginia; do by these presents, solemnly and mutually in the Presence of God and one of another, covenant and combine ourselves together into a civil Body Politick, for our better Ordering and Preservation, and Furtherance of the Ends aforesaid; And by Virtue hereof to enact, constitute, and frame such just and equal Laws, Ordinances, Acts, Constitutions and Offices, from time to time, as shall be thought most meet and convenient for the General good of the Colony; unto which we promise all due submission and obedience." The sentiments and statements of America's founders make it clear that this nation has enjoyed a love and appreciation for the rights and freedoms recognized in Natural Law that is unique in the annals of human history. No other people have such a heritage. One thing America's founders could not envision was - after they had paid so terrible a price to purchase our liberties - that the time would come when their posterity would be denied the basic freedoms to publicly express their reverence for God. Never could they have imagined that the day would come when citizens of the sovereign states (each with a State constitution protecting religious liberty) would be denied their right to pray in school, or place Nativity scenes on public property, or hang copies of the Ten Commandments on courthouse walls. I am also confident that America's founders would be completely repulsed by the way the United States has jumped headlong into corporatism, socialism, and globalism. At the national level, Democrats and Republicans alike have created a central government so large that it would be unrecognizable to any Founding Father (even Alexander Hamilton or John Adams). In addition, both Big Business and Big Religion have sold our great country down the old proverbial river. Truly, our Founding Fathers must be rolling over in their graves. Therefore, at this Christmas season, let us remember well the founding principles of these United States of America. Furthermore, let us renew with vigor the fight for freedom before our liberties and our heritage are gone altogether. Dr. Chuck Baldwin formerly of Florida now resides in Montana where he is Pastor of Liberty Fellowship in Kaspell, Montana. Dr. Baldwin also addresses current event topics from a conservative Christian point of view. Chuck Baldwin is a writer/columnist whose articles and political commentaries are carried by a host of Internet sites, newspapers, news magazines and the ARRA News Service. In 2008, Chuck was the Constitution Party Presidential Candidate. In Nov., 2011, he announced that he is a Republican Candidate for Montana Lt. Governor with Bob Fanning Candidate for Governor. Tags: Dr. Chuck Baldwin, Birth Of Christ, Birth Of America To share or post to your site, click on "Post Link". Please mention / link to America's Best Choice. Thanks! Posted by Bill Smith : Post Link --> 4:04 PM 0 Comments - Share Yours! Rob Bluey, Heritage Foundation: Americans hitting the road this week are likely to encounter the highest-ever price for gas at Christmas in history. According to figures from AAA, the nationwide average for regular unleaded is $3.21 per gallon — an increase of 23 cents over last year’s Christmas record. This marks the second straight year Americans are paying more at the pump during the holidays. The price in 2009 was around $2.60 per gallon and jumped to about $3 per gallon at Christmas last year. These higher prices aren’t grabbing headlines as they once did, but that doesn’t mean Washington should ignore the issue. As part of its North American Energy Inventory report, the Institute for Energy Research recently outlined steps that policymakers could take to reverse America’s decline in energy production. Removing barriers to drilling. Less than 6 percent of federal lands and 2 percent offshore are open to exploration, limiting the potential of Americans to produce energy here at home. Developing shale resources. America has the world’s largest supply of shale resources — the oil and gas found in rock formations underground. Stopping excessive regulation. The government has slowed down and even halted offshore drilling in the Gulf of Mexico, which supplies 30 percent of domestic oil production. There’s also the added benefit of more revenue for the federal government with increased energy production, a point Sen. David Vitter (R-LA) stressed on last week’s Scribecast. Tags: Christmas, David Vitter, domestic oil production, energy prices, Gulf of Mexico, Institute for Energy Research, offshore drilling, oil and gas, regulation, oil, gas, natural gas, peak oil, peak energy, department of energy, EIA, Heritage Foundation, Rob Bluey To share or post to your site, click on "Post Link". Please mention / link to America's Best Choice. Thanks! Posted by Bill Smith : Post Link --> 8:20 AM 2 Comments - Share Yours! The nation's premier swing state, younger and more diverse than you think, will be vital in deciding who wins the White House. Along the way, Florida could determine the GOP primary, too. By Linda Feldmann, Christian Science Monitor: ... Welcome to the biggest, most diverse battleground state in presidential politics, where every demographic group and, lest we forget, every vote matters. It's been 11 years since the days of "hanging chads" and Bush versus Gore, when the Republican governor of Texas and the Democratic vice president came closer to an exact tie in the final deciding state than anyone dreamed possible. 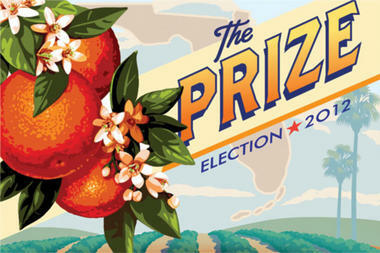 In 2012, Florida will be a more valuable prize than ever. This time, 29 electoral votes are at stake, up from 25 in 2000, of the 270 needed for victory. For the Republican nominee, Florida is a must-win – thus the choice of Tampa for the GOP convention next August. For Obama, winning without Florida will be difficult but doable. He has electoral votes to burn from the 365 he won in '08. Tags: Florida, 2012, elections To share or post to your site, click on "Post Link". Please mention / link to America's Best Choice. Thanks! Posted by Bill Smith : Post Link --> 10:07 AM 0 Comments - Share Yours! Gallup: Majority Of Americans View "Big Government As Biggest Threat"
Gallup released its poll last week detailing what Americans fear as the greatest threat to them. While Barack Obama and the Occupy groups have attacked the wealthy and and conservatives have expressed concerns about the abuses of unions, the survey shows that Democrats, Republicans and others have increasing agreed that the biggest threat in the last two years during Obama's presidency is Big Government. Gallup's Bottom Line: "Americans' concerns about the threat of big government are near record-high levels. . . . [T]he majority of Americans do not view big business as the greatest threat to the country when asked to choose among big business, big government, and big labor. In fact, Americans' concerns about big business have declined significantly since 2009. Additionally, while Occupy Wall Street . . . anti-big business message may not be resonating with majorities in any party. Republicans, independents, and now close to half of Democrats are more concerned about the threat of Big Government than that coming from big business." Tags: Gallup, biggest threat, Big Government, big business, Big Labor To share or post to your site, click on "Post Link". Please mention / link to the ARRA News Service. Posted by Bill Smith : Post Link --> 8:39 AM 0 Comments - Share Yours! Corzine - Where's The Money? 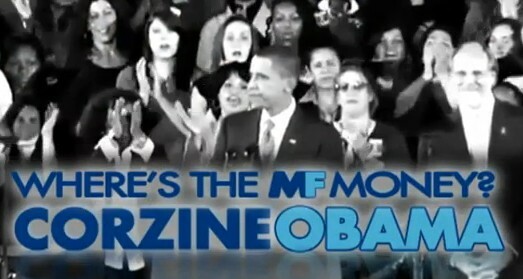 NRCC: Where's the MF money Jon Corzine? Missing: 1.2 billion dollars. HQT Studio:Former MF Global chief executive Jon Corzine apologized "to all those affected" by the brokerage's collapse Thursday as he told a congressional committee he doesn't know what happened to $1.2 billion in missing customer funds. Testifying under subpoena at a House Agriculture Committee hearing, Corzine, a former Democratic U.S. senator and ex-Goldman Sachs chief, portrayed himself as stunned about the massive shortfall that emerged as regulators and federal investigators began probing MF Global's Oct. 31 bankruptcy. "I simply do not know where the money is, or why the accounts have not been reconciled to date," said Corzine, 64, in his first public comments since his resignation was announced four days after the bankruptcy filing. Tags: Jon Corzine, Teflon, Wall Street, missing money, MF Global To share or post to your site, click on "Post Link". Please mention / link to America's Best Choice. Thanks! Posted by Bill Smith : Post Link --> 2:42 PM 1 Comments - Share Yours! Gov. Rick Scott, Florida Governor: In November, Florida’s unemployment rate declined to the lowest level in 29 months. With more than 120,000 net jobs created this year, Florida continues to move in the right direction. This month I laid out my proposed 2012 budget recommendations, which gives $1 Billion to education, and we will again balance the budget without raising taxes by streamlining spending and demanding accountability. Read more about my plan in the Daytona Beach News Journal. Tags: Florida, unemployment, falls, jobs To share or post to your site, click on "Post Link". Please mention / link to America's Best Choice. Thanks! 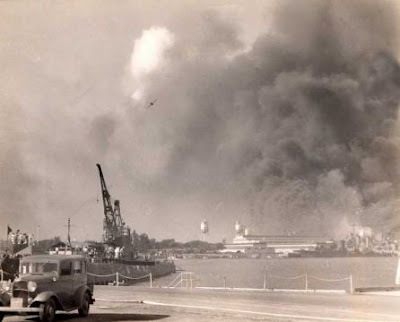 Posted by Bill Smith : Post Link --> 8:52 AM 1 Comments - Share Yours! We know that the persecution of Christians abroad is not a priority for the White House and many in Congress. But we need to make it a priority for ourselves. Again, please watch and share this video and please pray for the persecuted church. ARRA News Service - Gary Bauer, Contributing Author: Christmas is such a wonderful time of year, particularly here in America where we are free to celebrate the birth of Jesus without fear of outright persecution. Sadly, as most of you know, millions of Christians around the world cannot openly worship without fear of persecution and even death. Christians are undergoing a level of persecution not seen since the early days of the Church. The persecution is actually increasing as radical Islamists rise to power in the Middle East and Africa. And yet, scandalously little is being done by those most able to make a difference. We need to speak up. Meanwhile many here in Washington, D.C., are silent or worse about the violence. In fact, on this very day the Obama administration is meeting with representatives of dozens of countries to discuss hateful speech and religious persecution, not against Christians but against Muslims! If you are on Facebook, you can watch the video on my page, and share it with others. Knowledge is the first step to making a difference. I am asking each of you to do everything you can to promote this video. We cannot remain silent in the face of such evil. Jesus To share or post to your site, click on "Post Link". Please mention / link to America's Best Choice. Thanks! Posted by Bill Smith : Post Link --> 9:37 AM 0 Comments - Share Yours! Tags: ENTER TAGS HERE To share or post to your site, click on "Post Link". Please mention / link to America's Best Choice. Thanks! Posted by Bill Smith : Post Link --> 6:38 PM 0 Comments - Share Yours! ARRA News Service -- The House of Representatives this evening passed H.R. 3630, which protects Americans from a looming tax increase. This bill lets Americans keep more of their hard earned money and creates jobs through the Keystone pipeline while blocking job-destroying EPA regulations. Americans are asking "where are the jobs?" The Senate must act! Tags: American Jobs, We Can't Wait, Keystone XL, Keystone Pipeline, Pipeline Delay Threatens Jobs To share or post to your site, click on "Post Link". Please mention / link to America's Best Choice. Thanks! Posted by Bill Smith : Post Link --> 9:20 PM 0 Comments - Share Yours! December 13, 2011, Santa Fe, NM -- Former New Mexico Governor and presidential candidate Gary Johnson will be in the Miami, Florida, area on December 14 to address an evening event sponsored by the Hialeah/Miami Lakes GOP Club, the Miami Young Republicans Club, and the South Florida Conservatives. The Holiday Social will also feature a Presidential Straw Poll. Details for the event, open to the media and public: 7:00 p.m. EST – Hialeah/Miami Lakes GOP Holiday Social and Straw Poll, Alibi Restaurant, 7357 Miami Lakes Drive, Miami Lakes, Florida Governor Johnson will also be available for interviews with the media Wednesday while he is in the Miami area. To schedule, contact Joe Hunter at 801.303.7924 or media@garyjohnson2012.com. Tags: Gary Johnson, Miami, FL, presidential candidate, GOP To share or post to your site, click on "Post Link". Please mention / link to America's Best Choice. Thanks! Posted by Bill Smith : Post Link --> 8:19 AM 1 Comments - Share Yours! News-Press.com Editorial: It’s still eight months before Republicans and Democrats in Florida officially settle on their candidates for U.S. Senate, but the likely matchup is already clear, and it’s time to start comparing the combatants. Incumbent Democratic Sen. Bill Nelson and Southwest Florida’s own Congressman Connie Mack IV, who enjoys a huge lead over other GOP contenders in early polls, have extensive records for voters to examine. We present a selection of those votes today, plus information about where to find more material. The battle over Nelson’s Senate seat shapes up as a tight one, with Mack already at least competitive with the incumbent in the polls. A Quinnipiac University poll last month showed Mack trailing the senator 42 percent to 40 percent, a statistical dead heat. More recently, Democratic-leaning Public Policy Polling showed Nelson ahead 46-35; a Rasmussen poll has put Mack ahead 43-39. Tags: Florida, 2012, U.S. Senate Race, editorial, Bill Nelson, Connie Mack IV To share or post to your site, click on "Post Link". Please mention / link to America's Best Choice. Thanks! Posted by Bill Smith : Post Link --> 3:56 PM 0 Comments - Share Yours! In the Weekly Republican Address, House Speaker John Boehner (R-OH) addresses the Middle Class Tax Relief & Job Creation Act, legislation the House will vote on next week that will help to create thousands of new American jobs while helping families struggling with the consequences of President Obama's failed economic policies. This jobs bill (H.R. 3630) will extend the payroll tax cut, protect Social Security, reform and extend unemployment insurance, and extend pro-growth tax relief for businesses of all sizes -- while also advancing several bipartisan measures that will directly support the creation of private-sector jobs, including the Keystone XL energy pipeline. 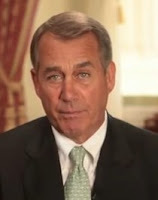 "You've heard President Obama say the American people 'can't wait' to take action on jobs," Boehner said Saturday. "Well, the Keystone project is the very definition of an idea the American people can't wait for Washington to take action on." "As you may know, the Keystone energy project would create tens of thousands of American jobs and reduce our dependence on oil from the Middle East," Boehner says in the address. "This jobs project has bipartisan support in the House and the Senate. It’s backed by a broad-based coalition, from small businesses to organized labor." Boehner said, "This is no time for the same-old my-way-or-the-highway theatrics. It's no secret that Democrats and Republicans often disagree about the best way to create jobs, but we can't let those disagreements prevent us from acting when we agree." Everything in the House bill is offset by spending cuts, rather than through tax increases that would hit small businesses and destroy jobs, as proposed in Senate Democrats' bill. Tags: Speaker John Boehner, jobs, job creation, Keystone XL project, middle class tax relief, bipartisan support To share or post to your site, click on "Post Link". Please mention / link to America's Best Choice. Thanks! Posted by Bill Smith : Post Link --> 8:05 AM 0 Comments - Share Yours! Where Did $36 Billion in Energy Department Financing Go? 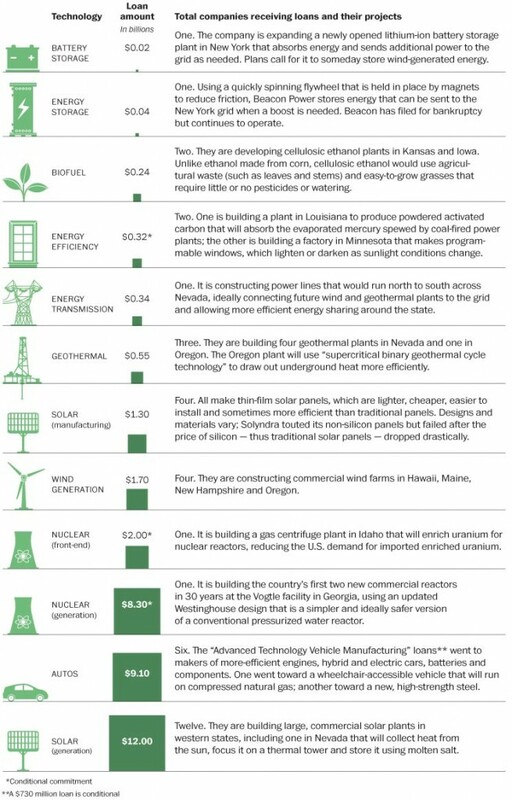 ARRA News Service - To answer the question about where YOUR MONEY HAS GONE, the Washington Post put together a iinfographic examining the distribution of $36 billion in Energy Department financing for renewable energy companies. Solar power generation companies were the largest beneficiaries of DOE’s “investments,” with twelve companies having received a third of the financing under the program. Tags: DOE, Energy Department, spending your money, Department of Energy, renewable energy, solar To share or post to your site, click on "Post Link". Please mention / link to America's Best Choice. Thanks! Posted by Bill Smith : Post Link --> 10:09 AM 0 Comments - Share Yours! President Obama’s economic stimulus was supposed to revive America’s economy and put people back to work. But nearly three years after Democrats rammed the bill through Congress, it’s a clear-cut failure. The nation’s 8.6 percent unemployment rate stands out as one of consequences. 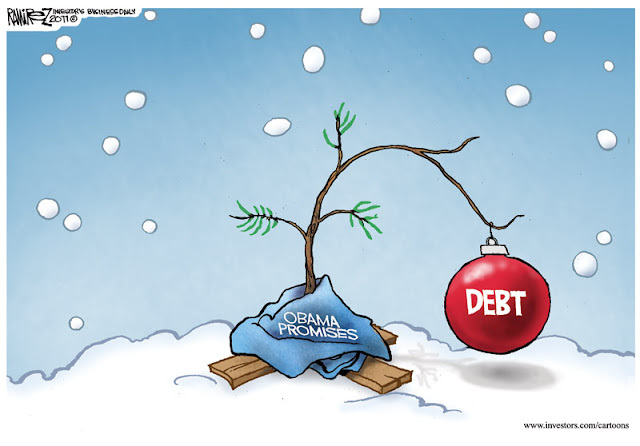 Then there is the high-profile Solyndra scandal and countless other government schemes gone awry. In a new video from Reason.tv, Jim Epstein takes a closer look at other examples — in a setting just a few miles from Capitol Hill. In Silver Spring, MD, government contractors pocketed big bucks from the stimulus. Government funding for green jobs, weatherized homes and infrastructure are among the other failures stemming from the stimulus in this community. Tags: economic stimulus, government contractors, government spending, green jobs, infrastructure, Keynes, Keynesian, President Obama, Solyndra, unemployment, Video To share or post to your site, click on "Post Link". Please mention / link to America's Best Choice. Thanks! Posted by Bill Smith : Post Link --> 6:14 PM 0 Comments - Share Yours! 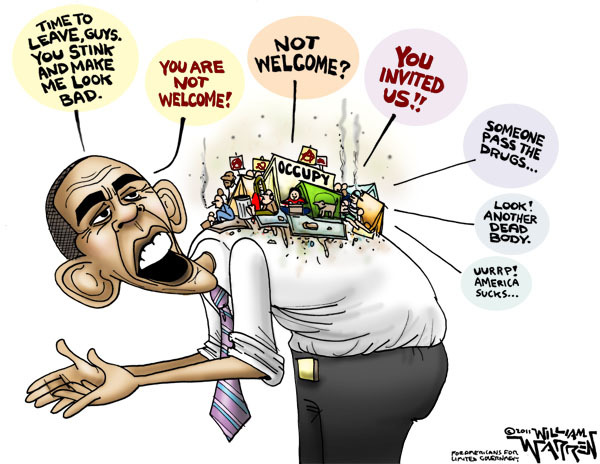 Obama To Occupy Movement: "You Stink! Tags: Barack Obama, Obama, Occupy Movement, Occupy Wall Street, You Stink, Political Cartoons, William Warren To share or post to your site, click on "Post Link". Please mention / link to America's Best Choice. Thanks! Posted by Bill Smith : Post Link --> 11:18 AM 0 Comments - Share Yours! 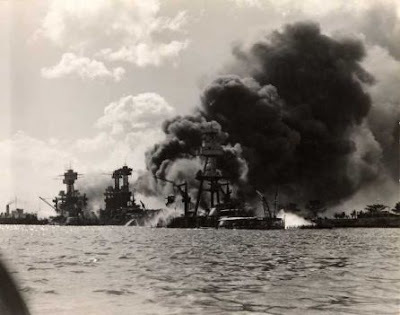 Conservative Oklahoma friend John R. Angier II (Okie Campaigns) put together the following remembrance of December 7, 1941. 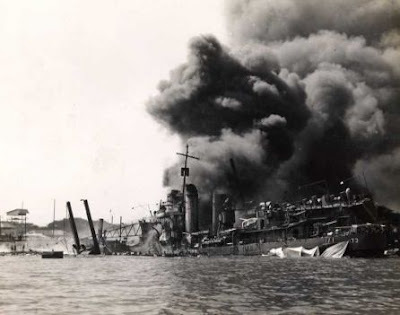 When President Franklin Roosevelt went before Congress on the morning of Dec. 8, 1941 to request a declaration of war against Japan, the outcome was a foregone conclusion. 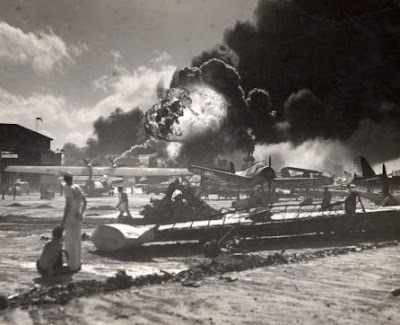 Japan had bombed the United States and killed thousands in a surprise attack at Pearl Harbor. But Roosevelt knew history would forever remember what he said. And 70 years later, his speech continues to serve as one of the most important in American history. Hostilities exist. There is no blinking at the fact that that our people, our territory and our interests are in grave danger. 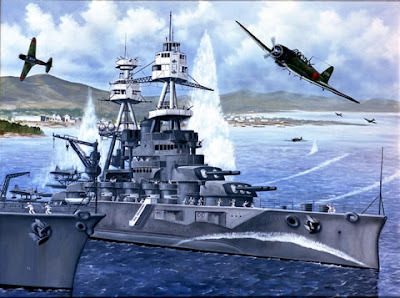 Adolf Hitler’s Nazi Germany and Benito Mussolini’s fascist Italy would declare war on the U.S. four days later. 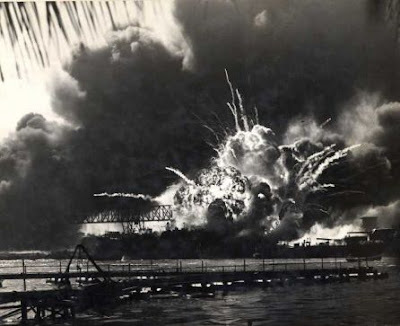 World War II would claim more than 400,000 American lives and millions more across the world. 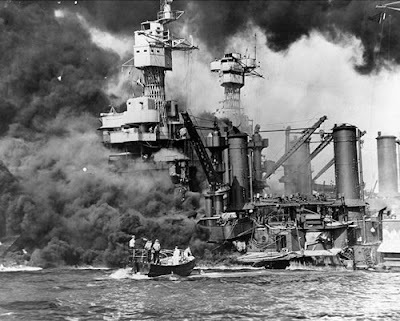 And it all began 70 years ago today. 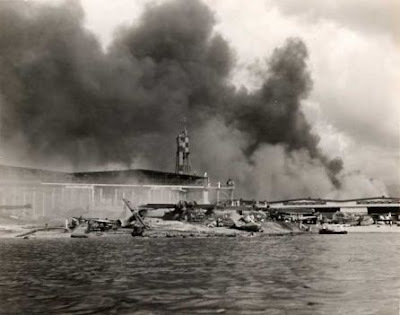 Tags: December 7, 191, Japanese attack, Pearl Harbor, Hawaii, remembrance, history To share or post to your site, click on "Post Link". Please mention / link to America's Best Choice. Thanks! Posted by Bill Smith : Post Link --> 10:04 AM 0 Comments - Share Yours! 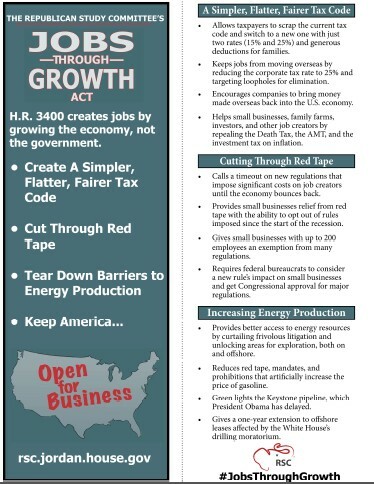 Rep Jim Jordan, Chairman, U.S. House Republican Study Committee: I encourage you to print off and distribute copies of this handy Jobs Through Growth Act pocket card. While President Obama’s various stimulus proposals seem to be more about his job than anyone else’s, the plan put together by House conservatives has the bold ideas needed to make a real, positive impact on our economy. Small business owners recently told Gallup that government regulations are the most important problem they face, and it’s a problem that just keeps getting worse. The 2011 Federal Register is already more than 75,000 pages long! Conservatives have looked all year long for ways to relieve our economy from this relentless onslaught of overregulation. The House will take another step this week by passing the REINS Act (Regulations from the Executive In Need of Scrutiny). H.R. 10, the REINS Act requires both Congress and the President to sign-off on all major new rules created by federal agencies. The end result will be more accountability and fewer job-killing regulations. This win-win scenario is exactly why the REINS Act was included in the RSC’s Jobs Through Growth Act. 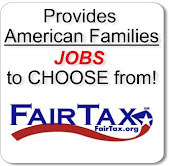 Tags: Jobs Through Growth Act, Pocket Card, Jim Jordan, RSC, gobernment overregulation, REINS Act, To share or post to your site, click on "Post Link". Please mention / link to America's Best Choice. Thanks! Posted by Bill Smith : Post Link --> 10:28 AM 0 Comments - Share Yours! Will Obama's Class Warfare Backfire? 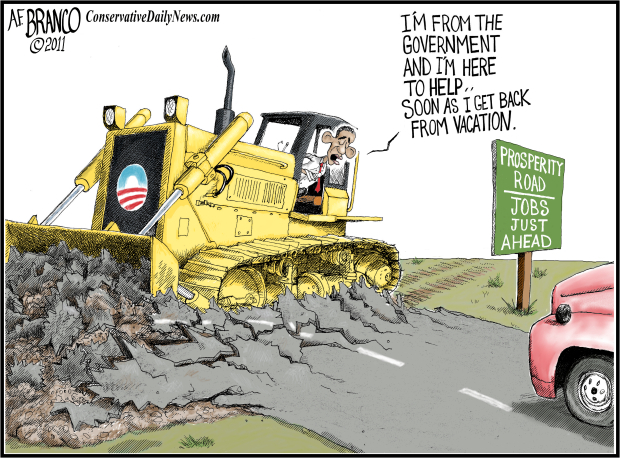 Barack Obama​ has spent much of his presidency attacking the rich and berating businesses for not hiring more workers. But many businesses aren’t hiring because they see an uncertain future with a President who at best doesn’t understand business and at worst is at war with capitalism. According to a recent Bloomberg report, the Obama administration approved 613 rules during its first 33 months. Obama’s regulations (many related to oil drilling, environmental protection, ObamaCare and financial reform) cost between $7 billion and $11 billion annually. The Obama administration has an additional 219 major rules under consideration, up from 137 in 2005, according to Bloomberg. It’s been years since Democrats have fared well among white working-class voters. Obama lost them in 2008, and he didn’t help himself by infamously referring to Middle Americans as clinging bitterly to guns, xenophobia and religion. The Democrats lost these voters by 30 percentage points in the 2010 midterm elections. 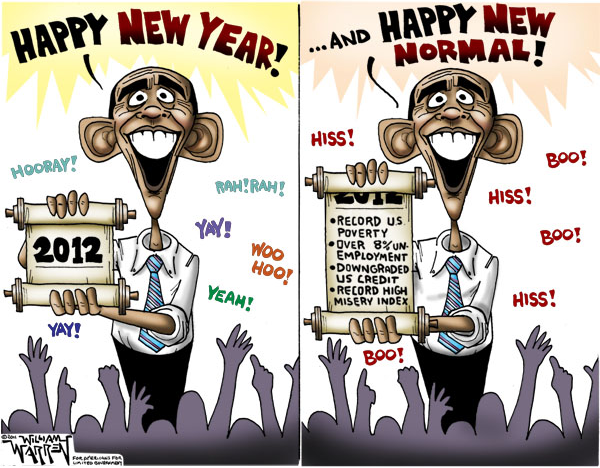 Obama’s reelection campaign will look like the polar opposite of his 2008 campaign. Hope and unity will be replaced by demonization and division. But Obama may ultimately unite two groups historically at odds—the titans of industry and the working class. They are both under assault by Obama’s socialist policies. Tags: Gary Bauer, Barack Obama, class warfare, businesses, jobs, no jobs, To share or post to your site, click on "Post Link". Please mention / link to America's Best Choice. Thanks! Posted by Bill Smith : Post Link --> 7:33 PM 0 Comments - Share Yours! Note, PPP usually polls for Democrats. Public Policy Polling (PPP): If the Newt surge persists over the next few months the biggest winner is going to be Barack Obama. ; We can see that pretty clearly in our newest Florida poll. If Mitt Romney's the Republican nominee, Obama's in a lot of trouble in the Sunshine State. Obama leads Romney only 45-44, and given that the undecideds skew largely Republican he'd probably lose to Romney if the election was today. Obama being stuck in the mid-4os against Romney is par for the course in our Florida polling. In September Obama led 46-45, in June it was 47-43, and in March it was 46-44. The dial has barely moved all year. Tags: Poling, Florida, presidential candidates To share or post to your site, click on "Post Link". Please mention / link to America's Best Choice. Thanks! Posted by Bill Smith : Post Link --> 4:16 PM 0 Comments - Share Yours!